First American edition of the author’s first novel and masterpiece. Octavo, original beige cloth. Translated by Stuart Gilbert. Near fine in a near fine price-clipped dust jacket. Jacket design by Warren Chappell. Through the story of an ordinary man unwittingly drawn into a senseless murder on an Algerian beach, Camus explored what he termed "the nakedness of man faced with the absurd." With the publication of this first novel L’Etranger (The Stranger), Camus introduced his lifelong attempt to reconcile a philosophy of heroic nihilism with “the ideal of human fraternity” (Encyclopedia of Philosophy). 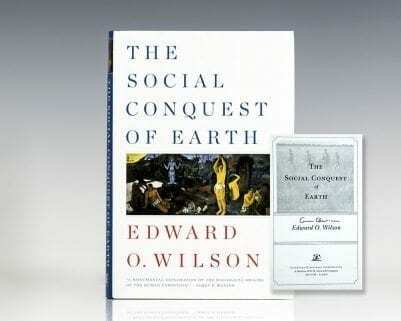 It remains one of the classic works of the twentieth century. New York: New Directions, 1947. First edition of this collection of two early Camus absurdist plays. Octavo, original cloth. Near fine in a very good dust jacket. Translated by Stuart Gilbert. 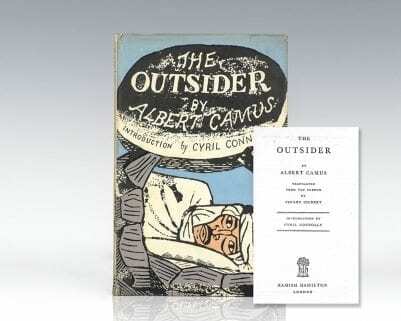 First American edition of Camus’ first novel and masterpiece. Octavo, original beige cloth. Presentation copy, inscribed by the author on the half-title page, “A Vincent Sheean pour le remercier de savoir si bien parler de Stendhal Sympathiquement Albert Camus.” The recipient, Vincent Sheean was an American journalist and novelist. Sheean’s most famous work was Personal History, which won one of the inaugural National Book Awards: the Most Distinguished Biography of 1935. Film producer Walter Wanger acquired the political memoir and made it the basis for his 1940 film production Foreign Correspondent, directed by Alfred Hitchcock. Sheean wrote the narration for the feature-length documentary Crisis (1939) directed by Alexander Hammid and Herbert Kline. He translated Ève Curie’s biography of her mother, Madame Curie (1939), into English. Sheean wrote Oscar Hammerstein I: Life and Exploits of an Impresario (1955) as well as a controversial biography of Dorothy Thompson and Sinclair Lewis, Dorothy and Red (1963). He studied at the University of Chicago, becoming part of a literary circle which included Glenway Wescott, Yvor Winters, Elizabeth Madox Roberts and Janet Lewis while he was there. Near fine in a near fine dust jacket. Jacket design by Warren Chappell. Translated by Stuart Gilbert. Housed in a custom half morocco clamshell box. Presentation copies of The Stranger are rare, with only one appearing at auction in the past 70 years. Exceedingly scarce and desirable. New York: Everyman's Library, 1998. 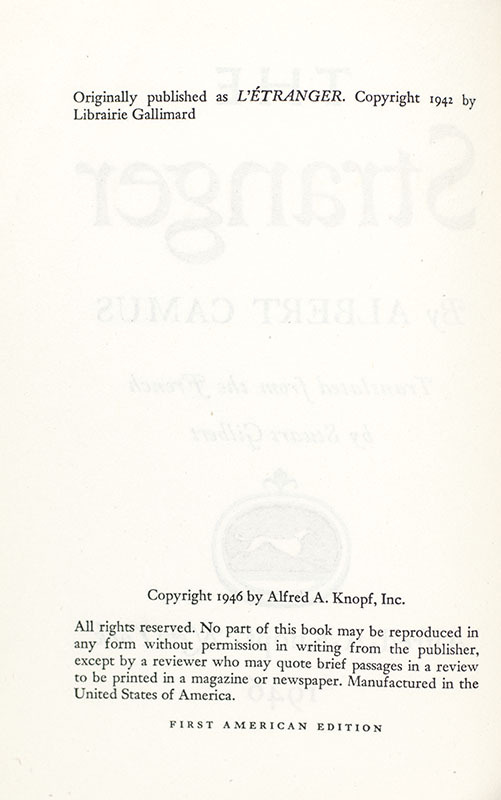 First Everyman’s library edition of Camus’ first novel and masterpiece, which was translated as The Stranger in the United States. Octavo, bound in full morocco by the Chelsea Bindery, gilt titles to the spine, raised bands, top edge gilt. Introduction by Peter Dunwoodie. Translated by from the French by Joseph Laredo. In fine condition. 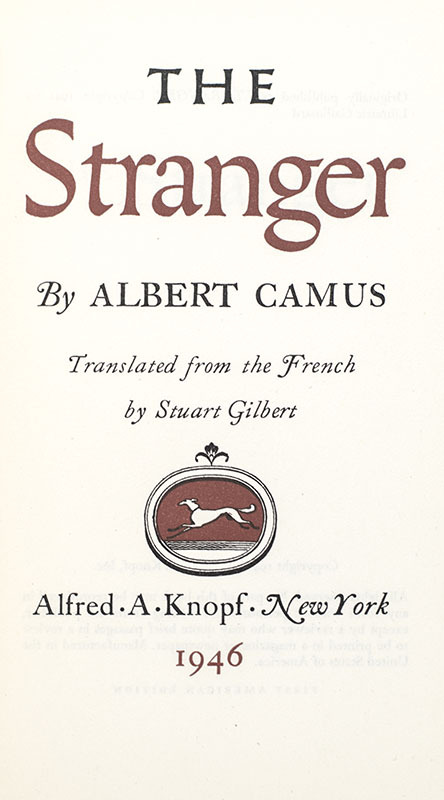 First British edition of Camus’ first novel and masterpiece, which was translated as The Stranger in the United States. Introduction by Cyril Connolly. Octavo, bound in full morocco by the Chelsea Bindery, gilt titles to the spine, raised bands, gilt ruled to the front and rear panels, inner dentelles, all edges gilt. Translated by Stuart Gilbert. In fine condition. 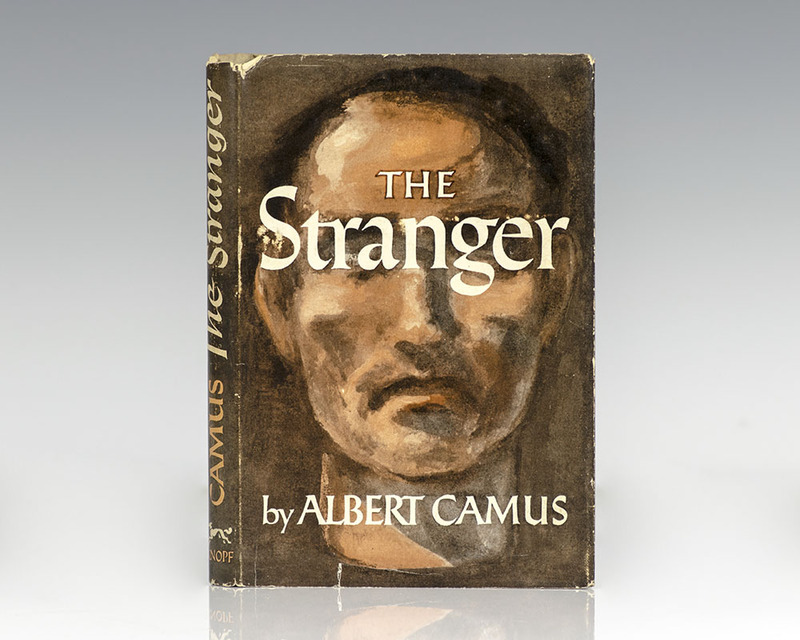 First British edition of Camus’ first novel and masterpiece, which was translated as The Stranger in the United States. Introduction by Cyril Connolly. Octavo, original cloth. Translated by Stuart Gilbert. Bookplate of British poet and publisher Felix Dennis, near fine in a near fine dust jacket with light rubbing to the extremities. Jacket design by Edward Bawden. An exceptional example, uncommon in this condition. 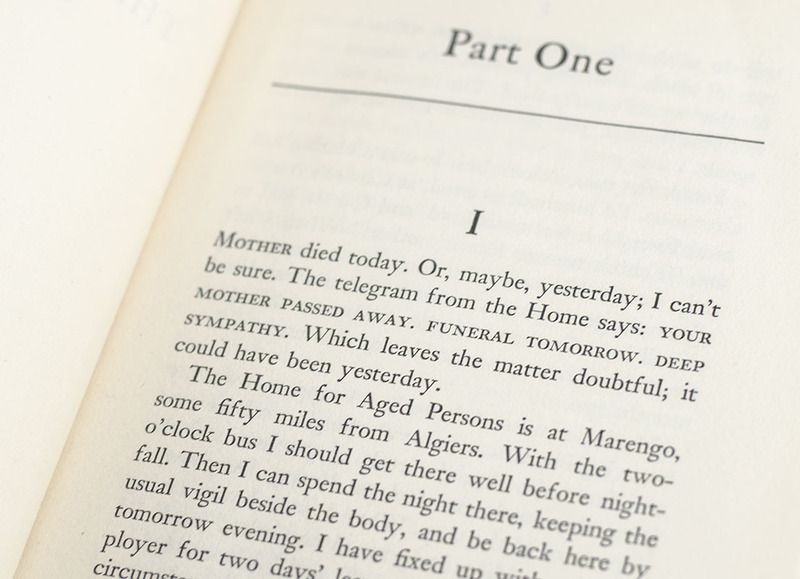 First edition of Camus’ short story collection exploring themes of existentialism and absurdism. Octavo, original cloth. One of only 950 numbered copies, this is number 783. In near fine condition. Rare and desirable. Camus, Albert. Translated from the French by Justin O'Brien. The Possessed: A Play in Three Parts. New York: Alfred A. Knopf, 1960. First American edition of Camus’ theatrical adaptation of Dostoyevsky’s masterpiece of the same name. Octavo, original cloth. Near fine in a very good price-clipped dust jacket. Jacket design by Paul Rand. Jacket photograph by L’Express.